This adorable bouquet captures the attention of all with its charm and breathtaking beauty. The marvellous contrasting colours of the creamy white Roses and the stem of bright orange Asiatic Lily blooms and the dash of greenery will lure your special someone to smile. Nobody can resist to smile wistfully, when they see Diana.Lilies may be sent closed/partially closed in order to prevent damage and to last longer.The vase in the picture is not included, however if you would like to make your flower gift extra special, why not add a vase to your order? We have 3 vases to choose from however; we recommend a Standard Vase for Diana. The flowers arrived the day before my Mum’s 91st birthday as I had ordered. She loved receiving them and said they were beautiful. My mother whom the flowers were delivered and while she was not home at the time the flowers had been placed in water; which was very nice and she absolutely loved them. 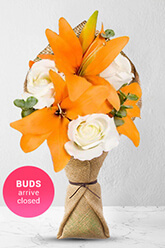 Ready flowers are so easy to use online. The flowers are always stunning and well received. I am very happy with this service. I nearly forgot. You fantastic staff reminded me had it set up ready to roll.. Flowers arived on time... Super stoked lov you all. Joe.